So, lets get to the “we may have opened a can of ants…” part. The other night at about oh, 10:30pm…Josh decided that it was time he figured out what had been causing a soft spot in the ceiling of the bathroom. A while back I had noticed the soft spot and found a few ants crawling around it. Thinking that it might just be a slow leak in the roof and a coincidence that there were ants, we used a blue-painters-tape-band-aid and covered up the boo boo. We knew that this remodel was coming up, so we figured it could wait until now. Well, Josh began to poke and prod and what did he find? ANTS! Thousands and thousands and thousands (you think I’m kidding…) of ANTS!!!!! Watching them pour out of our ceiling was probably the creepiest-crawliest moment I’ve had in my entire life…YUCK! We panicked and used an entire can of Raid on those suckers. We disturbed a huge nest of them that had probably been there for years, causing mass exodus into our bathroom. It ended up being more than just the 2 in. x 2 in. spot that we had anticipated…more like 2 ft. x 2 ft.!!! What a disaster! We spent two evenings after work cleaning up after those pests and finally just last night Josh was able to patch the gaping hole that resulted. Let me just say how blessed I am to have a husband who a) isn’t afraid to dive into a bathroom remodel b) is SUPER handy and able to fix most anything (or figure out how to if he doesn’t) and c) isn’t afraid of ants. Thousands upon thousands of them. I love you, Josh!! Don’t worry, this isn’t the last of the Spaceship Bathroom Remodel updates. Keep an eye out for pictures of the entire process and more details of everything we’ve done. p.s. 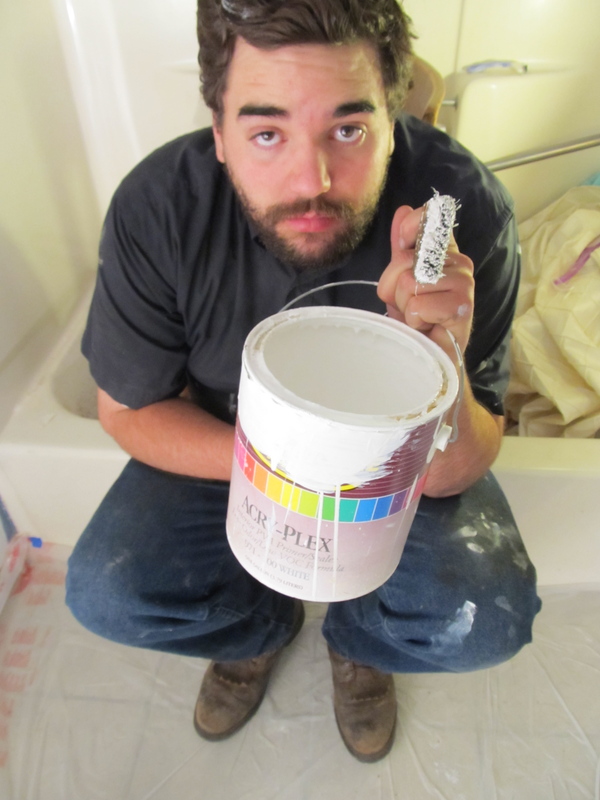 I’ll leave you with a picture of my cute handy-man of a husband. He just loooooves painting, can’t you tell?! EEEWWWWWW! oh my gosh that is my worst nightmare! ANTS!!! wow. you are both troopers. I can’t wait to see the bathroom!